Two of the better-known challengers of the evolutionary belief system met in Nashville, Tennessee, on Tuesday to discuss ways that the upcoming movie Expelled can have a major impact. On Tuesday, Ben and Ken met at a special preview showing of Ben’s eye-opening and highly entertaining film Expelled: No Intelligence Allowed. A full review of the Expelled film will appear on this website later this month. 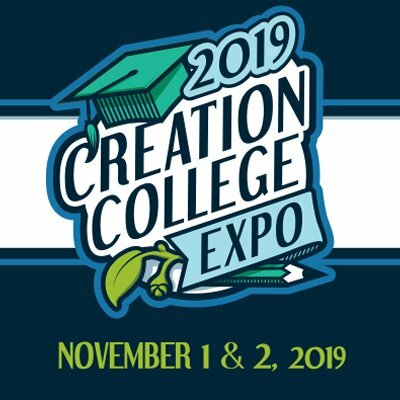 Two of the better-known challengers of the evolutionary belief system met in Nashville, Tennessee, on Tuesday to discuss ways that the upcoming movie Expelled: No Intelligence Allowed can have a major impact on the creation/evolution debate. Expelled is hosted by the brilliant Ben Stein, actor/economist/lawyer/presidential speechwriter/science observer—a 21st-century Einsteinian figure. While his film arrives at American movie theaters on the weekend of April 18, Mr. Stein came to Nashville for a special preview showing of Expelled for several hundred attendees at the annual convention of the National Religious Broadcasters (NRB). The audience leapt to its feet with generous applause at the film’s conclusion—moved by the undaunted attempts of the Darwin-doubters (and their filmmaking allies) as they challenge the elites in America’s educational and scientific establishments. 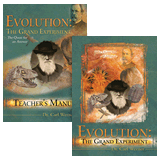 Many of these Darwin challengers find themselves pitted against powerful evolutionists who despotically protect their evolution belief system, and sometimes expel those who would dare question Darwin. 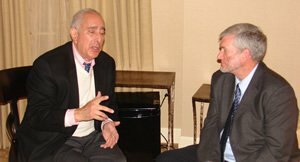 Before Tuesday’s film preview, Mr. Stein spent 15 minutes chatting with AiG-U.S. President Ken Ham, who informed Mr. Stein that he had seen a director’s cut of Expelled last month at AiG’s Creation Museum. Ben told Ken that he was aware of the “wonderful” facility near Cincinnati and hoped to visit one day (and also to enjoy his favorite ice cream at a parlor chain in our area called Graeter’s, he told Ken!). “I urge everyone not to miss Expelled. I found it riveting, eye-opening, even astonishing. Ben Stein does a masterful job of exposing the ruthlessness of evolutionists who will go after anyone who challenges or merely questions Darwinian orthodoxy. I was on the edge of my seat—entertained yet instructed. Ken noted that while Stein is not a biblical creationist, the film he hosts provides a valuable service, as it exposes the tyranny of leaders in the evolutionist community. The film, notes Ken, also reveals the massive scientific problems with evolution theory. “Freedom is the essence of America,” Stein declares in his narration. He adds that science is supposed “to pursue any line of inquiry,” but when it comes to evolution, that practice is not just ignored, but the freedoms of Darwin-questioners are trampled upon. Several such examples are presented in the film. One of the saddest moments in the film occurs when a self-described Christian university (Baylor University in Texas) is documented as persecuting one of its own because he questioned evolution.1 Ironically, the façade of one of its buildings has a verse inscribed on it from the book of Colossians, which declares that, in God, all things were created by Him. Ben and Ken are requesting the backing of AiG supporters to get out the word about this both entertaining (which features flashes of humor even amidst some tragic moments) and important film. Mr. Stein and the film’s producers told Ken on Tuesday that if large numbers of people come to the movie theaters during its opening weekend (April 18–20), it would send a strong message to other movie houses to carry it, for the film’s theme of repressive censorship and a call for a restoration of freedoms is resonating with so many people. Call or go to your local movie theater and ask the manager to show the film. If you are not sure where/whom to call in your area, then call this toll-free number in the U.S. and someone will share that local information with you: 800-705-0485. Go to your church leadership and encourage them to buy out a local theater so that Expelled could be shown there—and then make sure as many people from that church attend as possible. Send the following e-mail link about the film to your email contact list: www.expelledthemovie.com/playground.php and also send them this AiG article you are reading. These actions are key to a successful promotion of this heroic film, for a backlash is already building against it by the evolutionist community. We encourage you to spend time browsing the interactive Expelled website: www.ExpelledTheMovie.com. Our movie review of Expelled will be posted to this website later this month. Baylor describes itself as a Baptist university where “students are a part of a Christian community of faith” (http://www.baylor.edu/about/); however, see News to Note, September 15, 2007, item #2.